We would all love to be able to grow new teeth. The only problem is it takes our bodies about 6 years to grow our first adult teeth. 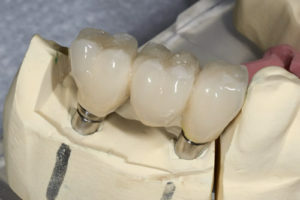 Dental implants look and feel like a natural tooth and can truly change the way people live. Dental implants can give people back the confidence to eat, laugh, speak and enjoy life. If you have gap in your smile, or an unreliable denture, it might be the solution for you. A small titanium screw takes the place of the missing tooth root. The jaw bone recognises the titanium as self and grows onto it creating a stable foundation to rebuild the tooth onto.